Have you ever heard of psychoacoustics? It has to do with the subtle considerations of how people experience sound: how the sound is delivered and who the intended listener is. It’s an essential part of any museum experience and yet, as acoustic consultant Steve Haas acknowledges, sound design is so underrated that the sign of a job well done is that no one even notices. Haas has been managing sound in the world’s top galleries and museums for the past 25 years, and he is the expert who has been called in to help with the acoustic challenges facing the new Canadian History Hall. The Director of Creative Development and Learning for the Hall, Lisa Leblanc, helped Haas identify and cater to the Canadian Museum of History’s primary audience: families. Historians, tourists and others visit the Museum individually, but the majority of visitors come as groups, and the end result is quite a social experience. Kids make noise, people discuss displays and families interact — so how can we ensure that each group isn’t disturbing everyone around them? “It’s going to be a lively space,” Haas said. “The subject matter does not preclude that, so we have to take in that psychology.” Inclusiveness is built into displays: some exhibits encourage kids to sit and interact with an element while the adults stand behind and discuss what they see and hear. Focused speakers allow sound to travel upward to reach a small group in the direct vicinity, and then continue on to be absorbed into the ceiling. Alternatively, if the speakers were throwing sound horizontally across large spaces, the result would be a mess of sound bleeding between exhibits. Every element of a display has a social consideration: text is created with the goal of being read out loud, headphones are minimized and even the content of sound is carefully deliberated. A chirping bird has a much different impact on the listener than a roaring T. rex, and present-day sound bites are heard much differently than archival material, and sound technicians must incorporate these expectations into the design. Occasionally, content dictates a more intimate experience — for instance, some displays covering the topic of residential schools are arranged with a chair and overhead mesh to offer an enclosed, private experience. 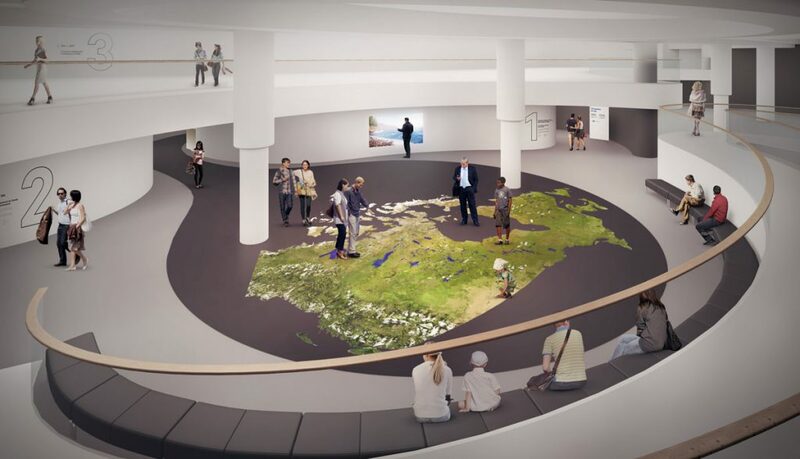 Though the idea of the Canadian History Hall is to present a continuous thread that connects us all through a shared history, it’s important that the acoustics allow each group of visitors to express themselves in a contained way. Sound complicated? We hope not. If everything goes as planned, you won’t even notice. Come back soon to check out our next post: Acoustic Challenges Under the Dome.